A few days ago a friend from high school posted on Facebook about needing some help from someone who knows Photoshop. Not knowing what she needed, I responded and offered what semi-limited moderate knowledge I have. 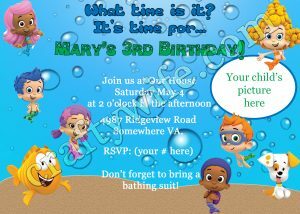 It turned out that she was looking for a birthday invitation design for her twin daughter’s birthday. Well, invitations are right up my alley so I was more than willing to develop a few prototypes for her to consider. 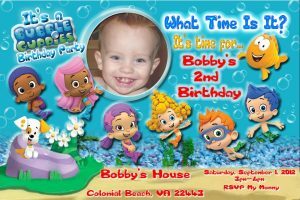 I have to admit, when she said it was a Bubble Guppies themed party I had absolutely no idea what she was talking about. I don’t have kids so I don’t have Nick Jr. or Disney Junior playing in the background yet. Suddenly, Wikipedia was my best source for information. My friend also sent me a prototype of a card she liked so I could branch off from that. I don’t know the source of this photo, but if anyone knows please let me know! I’d like to give them credit for this gorgeous card! So, I sat down at my computer to see what I could come up with. All of the images I used are from Google, I made all the card backgrounds in Photoshop, and I downloaded a few bubble fonts from DaFont.com. I won’t ruin it and tell you which one she picked (most people will find out when she sends the invites). For now, it’ll be fun just to guess.